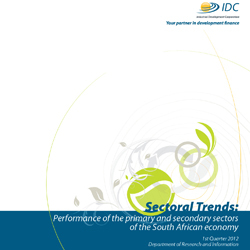 On 6 February 2012 the IDC released its research report entitled Sectoral trends: Performance of the primary and secondary sectors of the South African economy. The Industrial Development Corporation (IDC) today released its research report entitled Sectoral trends: Performance of the primary and secondary sectors of the South African economy. The report includes a special focus on the mining industry called “The untapped potential of South Africa’s mineral wealth”, coinciding with the 18th Annual Mining Indaba being held at the Cape Town International Convention Centre this week. The report provides an analysis of the production, employment and external trade performance of three broad sectors and 30 sub-sectors of the South African economy up to and including the third quarter of 2011..
Head of IDC’s Research and Information Department Jorge Maia says that the deterioration in the global economic outlook, particularly the European sovereign debt crisis holds serious downside risks for the South African economy. “It has now fallen on the emerging and other developing economies to sustain the world’s growth momentum, since a contraction is forecasted in the Eurozone, while the USA and Japan are expected to record only very modest growth,” says Maia. The report cautions that South Africa’s manufacturing sector is likely to continue experiencing challenging trading conditions due to intense foreign competition in the local market and a strong dependency on European demand. Commodity exporting countries, including South Africa, could also experience less favourable demand conditions in 2012. He says despite the challenging global conditions, employment in the domestic mining sector as a whole has almost returned to pre-crisis levels. “Comparing the first three quarters of 2011 with the same period a year earlier, the biggest percentage gains in employment were recorded in the manganese, iron ore, chrome and diamond segments, whilst large employers such as the platinum group metals and coal mining segments also recorded healthy job growth,” Maia adds. According to the report, South Africa’s raw mineral exports have increased steadily over the past decade, while exports of beneficiated minerals are already exceeding pre-crisis levels in value terms. The potential for expanding the base of South Africa’s minerals-based beneficiated products is expected to be progressively realised in the years ahead. However, Maia believes that South Africa’s mineral extraction rates lag behind global averages in key mineral sectors.